Keeping your horse’s surroundings and gear clean is important to help keep your equine healthy and performing at his best, and to prevent disease spread. There are some simple changes to help stop horses getting sick, so that horse owners can deploy an effective biosecurity plan. The topic was discussed during Equine Guelph’s recent online Biosecurity short course, which featured guest speaker Dr Alison Moore, lead veterinarian for Animal Health & Welfare at the Ontario Ministry of Agriculture, Food and Rural Affairs. Moore stresses the importance of having a biosecurity plan and being able to communicate it clearly with every member of the barn community. The best way to clean and disinfect is to have a surface that one can truly clean and disinfect. This means wood surfaces should be sealed. Stable surfaces should be non-porous. Flooring is not dirt but one that has been sealed on installation. Depending on the barn and barn materials, organic debris (urine/manure) can be removed from the inside of the stall using water and a brush or a hose then sprayed with Virkon or Accell – contact time will vary slightly depending on the reason for disinfecting (as a precaution or because an infectious organism was diagnosed). Most contact times will vary between 10 and 30 minutes (with 10 minutes being more common). Use a large garden sprayer with the appropriately diluted form of Virkon or Accell, or wipe it on using a sponge. Moore cautions against the use of pressure sprayers as they can aerosolize certain viruses. Squeegee any excess disinfectant off the floor. If there are rubber mats, remove them, clean with water and brush, and disinfect both sides before placing them back in the stall. Feed and water buckets should also be cleaned and disinfected, making sure to rinse well before their next use. Wash stalls are another area that should be cleaned and disinfected with regularity. Moore pointed out some of the downsides of using bleach as a disinfectant, including the fact the fumes can irritate your animal’s airways. Bleach can inactivate certain organisms but it is deactivated by organic material and particularly in the presence of urine, so the stall has to be cleaned really well with a detergent first. The detergent must be rinsed and the area dried before the bleach is applied. Unlike their human counterparts, horses tend to receive their first influenza shots of the year in the springtime in anticipation of outings and increased exposure to pathogens. Horses that travel for more than one season will often have multiple boosters to promote a healthy immunity. When planning your horse’s vaccinations, your veterinarian should be consulted to find out what diseases are endemic to your area and discuss where you plan to travel with them in the upcoming months. Beyond vaccinations for diseases such as eastern equine encephalitis (EEE) and West Nile, there are more precautions to help deter the spread of diseases transmitted via insects. Removing breeding grounds can be accomplished by eliminating standing water (eg, old water feeders, tyres around the property) and getting rid of puddles by improving drainage. Keeping manure storage as far away from the barn as possible but accessible for staff is helpful. Fly zappers and tapes can be beneficial. 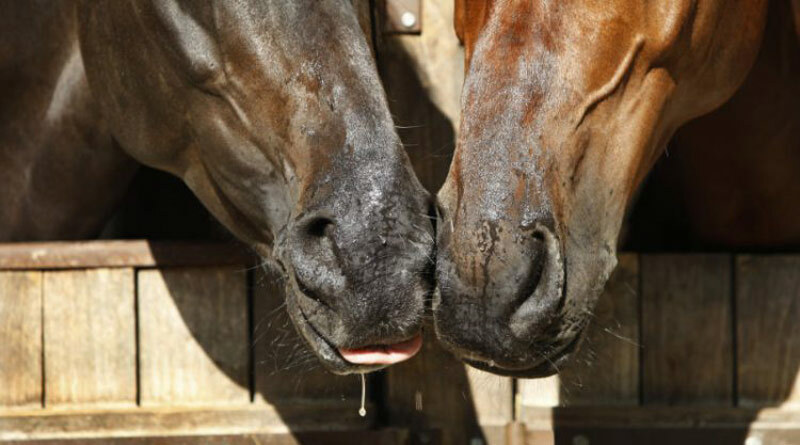 There are also products that can be fed to horses to interrupt the development of fly larvae in the horse’s manure. Fly bait can also be useful but should be used with caution if dogs and cats are around. Other options to control flies and mosquitoes include insecticide impregnated blankets/sheets and the traditional fly sprays. If you are lucky enough to own a horse trailer, you can perform the same level of care as recommended above for cleaning and disinfecting stables. When you use a commercial shipper you are putting your horse’s health in their hands so there are a few questions you should ask in order to be comfortable with the services they are providing. You should also be comfortable with other management practices of the transporter. Some transporters have climate controlled stalls and food and water available at all times, whereas others have more traditional trailers and don’t stop to feed or water (depending on the length of the journey). It is important, therefore, that you ensure your horse is healthy enough for the trip particularly if it’s a long one – meaning that the horse is well hydrated and in good flesh. A horse that begins the journey in a healthy state is more apt to finish it in a healthy state. You should make sure your horses are appropriately vaccinated for the place to which the horse is travelling. Avoid vaccinating too close to shipping. “Depending on the vaccine used, you want to be at least 2-4 weeks out from the shipping date when you vaccinate,” Moore says. There are some products called immunomodulators that can support the immune system when shipping as well that can be beneficial. On arrival at the barn (or receiving a shipped horse), the horse should ideally be separated from the resident horses in a quarantine area or separated from the other horses in the barn by a stall. Temperatures should be monitored twice daily for at least 7 days (preferably 14 days) and fevers reported to your veterinarian. Dr. Alison Moore will be a guest speaker in the next online offering of Equine Biosecurity – Canada’s standard, April 10 – 28.